In the Trumpeter Swan Cygnus buccinator research laboratory at Western Oregon University, research is continuing to investigate the factors that affect the long-term persistence and resilience of Trumpeter Swan flocks in the Greater Yellowstone Ecosystem. We currently have two research projects ongoing and are seeking funds for new projects. 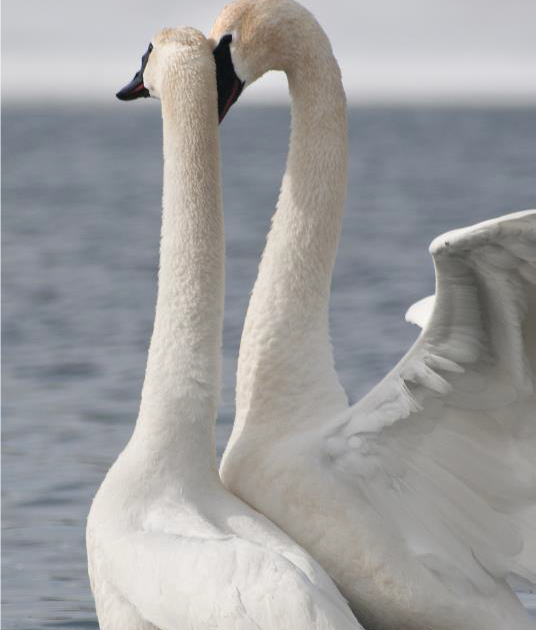 Trumpeter Swans courting (photo: Richard Sonnen, courtesy of The Trumpeter Swan Society). Firstly, we will complete data collection for a five-year dataset on the abundance, distribution and species richness of the aquatic macrophyte community at the Harriman State Park Trumpeter Swan wintering site. These data will be compared with original data collected in winter 1988/89, to identify any significant changes in food supply between the two time periods. Secondly, we will complete data analysis and prepare a manuscript on the initial findings of our nest incubation study, which used data-loggers implanted into artificial eggs. This cooperative project also involves the Wyoming Wetland Society, WOU, and the U.S. Fish & Wildlife Service. In the future, following on from this work, we plan to include additional nesting sites in the ecosystem. Finally, we are in the early stages of a proposal to investigate the migratory pathways of Trumpeter Swans in Washington and Oregon, with a view towards understanding potential metapopulation dynamics in this area.